Prolong the life of your bread knives with this wedge-shaped ceramic sharpener that gets in between the teeth of a serrated knife to make for a faster, safer bread slicing experience. This sharpener is ambidextrous, easy to use for both left-handed and right-handed individuals. 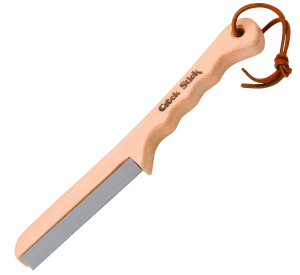 Ideal for sharpening serrated bread and steak knives. Step 1 - Grip the sharpener firmly by the handle using your dominant hand. Step 2 - Holding the knife firmly with the other hand (with the edge facing away from you!) bring the edge of the sharpener to the serration. Step 3 - While maintaining a consistent angle and with even pressure, gently push the sharpener against the serration, while using a rolling motion to sweep the sharpener’s corner from one side of the serration to the other. A single stroke will remove any burrs on the reverse, flat side of your blade.